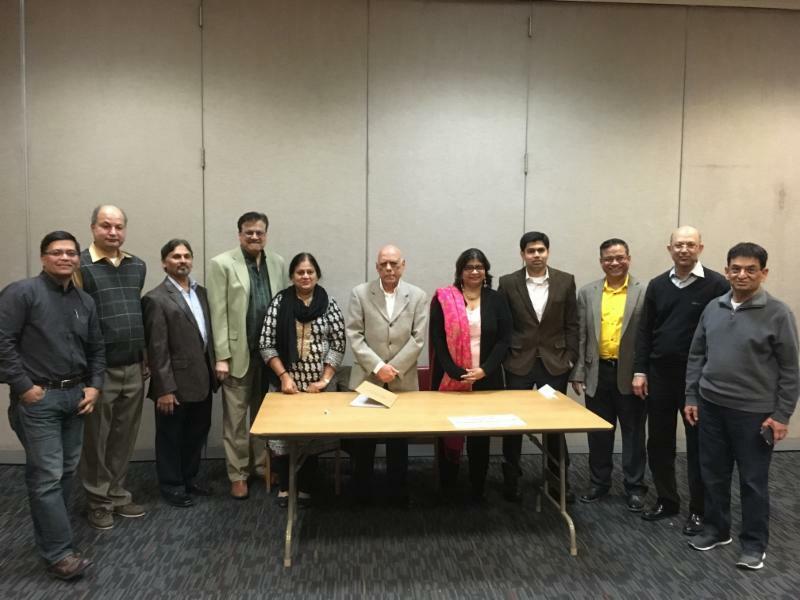 Annual Meeting and the Elections: The Aligarh Alumni Association, Washington DC (AAA), held its general body meeting and elections on Sunday, March 26, 2017, at the Montgomery County Office Building. The outgoing president, Mr. Masood Farshori, briefly reviewed the activities of the Association during the past year, highlighting some of its signature events, such as the Annual Mushaira, Sir Syed Day Lecture and Dinner, mid-term Mushaira and Kavi Summaylan. Dr. Abdullah Abdullah, Chairman Board of Trustees, discussed some of the initiatives that the Association might undertake in the current year, including celebration marking Sir Syed’s two-hundredth birth anniversary this year. Information about the financial health, income and expense account of the Association was presented by the treasurer, Khurshid Usmani. Although the Association suffered some loss in hosting the Mushaira and Sir Syed Day Dinner, its overall financial health remains sound. A detailed account of the scholarship program and status of financial investments was not available, since Dr. Aftab Ansari was indisposed at the time. The report, he promised, will be provided at a later date. The outgoing president, Mr. Masood Farshori, will now serve as the ex-officio member of the EC. * Election of two trustees was necessitated by the election of Dr. Rafat Husain to the position of president. Urdu Academy Program: Ms. Tahira Aziz is a social worker, who runs the Urdu Academy in Montgomery county, MD, that strives to introduce Urdu to non-Urdu speakers, and promotes it as one of the foreign languages taught in the County schools. The Academy, in collaboration with the AAA, is planning a one-day program in the near future, which will include a wide variety of activities, including lectures, skits on Urdu, ghazal recitations, display of books, food and colorful dresses. (Courtesy, Dr. Razi Raziuddin). AMU Celebrates Women’s Day: In solidarity with the International Women’s Day, the University collaborated with the UN Information Service in organizing a seminar on March 7, 2017, at the Moulana Azad Library. In his inaugural address, Vice-Chancellor General Zameer Uddin Shah highlighted the University’s policy of enforcing gender equality. The chief guest, Dr. Syeda Saiyidain Hameed, a former member of the Planning Commission, delivered the keynote address, in which she cited inspiring examples of women who had struggled to achieve equality. AMU Rated Ninth Among the Indian Universities: The Aligarh Muslim University has been ranked ninth among the top ten institutions of higher learning in India, according to the latest survey conducted by the Times Higher Education (THE) Magazine, UK. The vice chancellor and members of the faculty have welcomed the news with pride. Nobel Laureate Honored: At its 64th Annual Convocation, the AMU conferred the degree of Doctor of Science (DSc), honoris causa, on Professor Takaaki Kajita of Japan, an eminent nuclear physicist and Nobel Laureate. In his acceptance speech, Prof Kajita urged the AMU faculty members to undertake research projects and actively participate in conferences, workshops and training programs (Contributed by Dr. Razi Raziuddin). Moulana Hali on Sir Syed: Sir Syed Ahmad Khan was a gracious host and his hospitality extended widely. He was unhappy when on rare occasions he found himself dining alone without any guests. After Aligarh became the pivot of Muslim cultural and educational activities in the late nineteenth century in the heydays of Aligarh movement, his house became a virtual guesthouse where a large number of eclectic guests enjoyed hospitality. At the dinner table, conversations revolved around a variety of topics–religion, politics, scholarship, history- often blending with jokes and entertaining stories. Sir Syed’s kitchen did not present a large variety of dishes, but the food served was always of high quality and exquisitely prepared. He was fond of seasonal fruits and vegetables; mangoes and melons were his favorites and always found a place on his table. I have heard that in his youth, he had a prodigious appetite, but in his old age, he became frugal in his eating habits. He religiously drank a glass of milk after every meal.